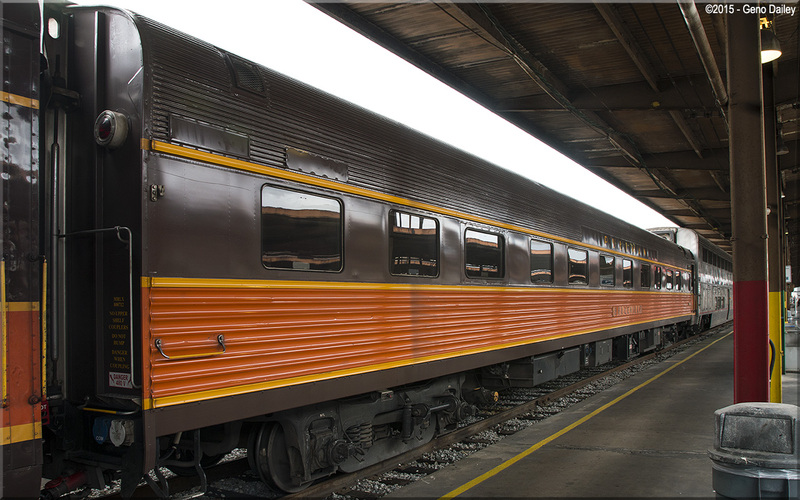 Built by Budd in 1952 for the Chicago, Burlington & Quincy RR as a 5-compartment 6-double bedroom sleeper for use on the CB&Q-Denver & Rio Grande Western-Western Pacific "California Zephyr". Conveyed to Amtrak in 1971 and listed as an 11 double bedroom sleeper and numbered 2201. Converted to Head-End Power from Steam Heat in October 1983 and renumbered 2220. Listed for sale in December 1995 and sold in 1997 to Illinois Transit Assembly Inc. Later acquired by Mid-America Railcar Leasing, followed by Iowa Pacific Holdings who rebranded the car with its Illinois Central-inspired paint scheme and renamed it "Belleville". The car today has Amtrak Private Car #800712. Historical information about this car provided by amtrakbythenumbers.com, & rypn.org.